“Until recently, Helvetica’s dominance was so assured that the M.I.T. Press could publish Helvetica and the New York City Subway System: The True (Maybe) Story by Paul Shaw, a design historian,” writes David W. Dunlap. “He concluded his account by stating that white-on-black Helvetica signs were ‘now as much a part of the New York City subway system’s visual identity as its century-old mosaics.’ Then along came the memorial, whose mark is set in white and blue Gotham.” Check out Dunlap’s whole article for some interesting thoughts on the precedents that this new addition the subway’s signage system presents. 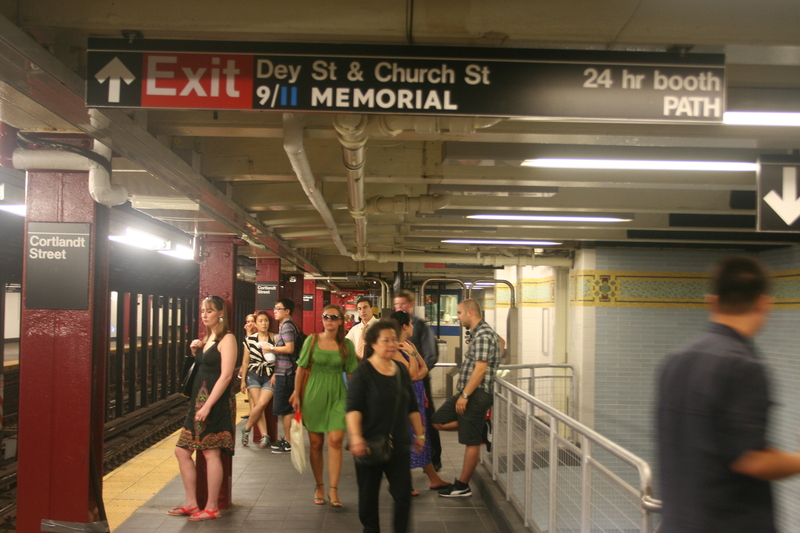 The 9/11 Memorial signs can be found at several subway stations in the vicinity of City Hall and Wall Street. I photographed them at Cortlandt Street (R), Fulton Street (2, 3) and Whitehall Street (R). November 19, 2011. David W. Dunlap has updated his research into the origins of the 9/11 Memorial logotype. Turns out that the typeface used is a custom blend of Gotham and Verlag made by Landor Associates. David’s illustration of how the two were modified is excellent. This is the sort of writing about type and typography in the mainstream press that those of us in the trade can appreciate.